You’ve got to fight for you right, for an education: protest or pointless? It’s been some time since a blog has infuriated me and enabled me to jump off the fence and join a side. Dying your hair a bright shade of purple is nothing shocking in the slightest. These days people of all ages are joining in the revolution of unnatural hair colourings, so when I spotted this share, I believed there had to be more to it… To my annoyance there wasn’t. According to the student, her plea has been shared over 32,000 times (I’m sure not all 32,000 times are positive shares but combine my negative view.) I do not know how old Isabelle is, I’m not even sure if she is English, American, Canadian etc but I do know that she is incredibly naive and perhaps far too wrapped up in this societies social media concepts. She’s not a rebel, she is not an activist, she is simply a stubborn girl that doesn’t want to dye her hair back to its usual mousy brown hue. 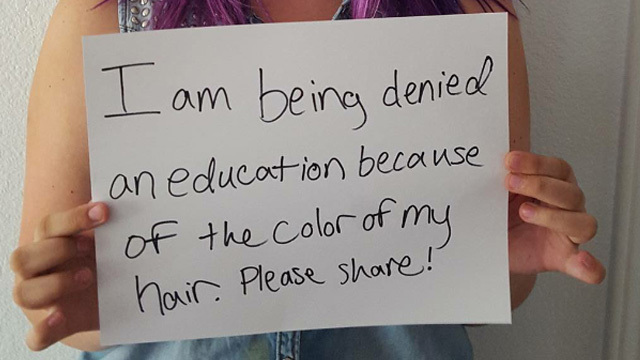 The rules stated when I was a school student that hair must be of a natural colour, and as much as I can see its no biggie to have purple hair, why should Isabelle be exempt from the rules? I even went into a job role where that was the same issue, thrown in that tattoo’s must not be visible and voila.. Did I throw a hissy fit about it? No. It offends me quite frankly that she’s protesting about this as if it were something she was born with. Was she born black and in 1910? Had she known herself to be Bi/ Lesbian and have the prosecution that she couldn’t get married until now? Those are examples that can’t be changed, one can’t be cured of being gay and one can’t change the colour of their skin but this young girl can the colour of her hair. I can’t fault her for spreading her story but I think it’s a bit of a joke that it’s being so widely spread. I think back to the Pakistani school girl who was shot in the head for her campaign to ensure females the right to an education. It makes Isabelle’s case seem trivial! Malala Yousafzai was just 14 when she depicted how she wanted so badly to have the entitlement to an education, so much so I can imagine she would have shaved her head for that right. Rules are with us to stop persecution, bullying and suffering. I remember my school would say our skirts must be a certain length to which our teachers tried in vain to get us to pull them down, to then roll them up again. Piercings were frowned upon unless it was one set of earrings, a stud, not dangley’s, definitely no nose piercings. So sadly when my best friend came into school with her nose pierced she was instructed to remove it or be removed from school. Dye your hair on school holidays, have that exhilarating change and come back to school with the comradeship that you’re there to learn. Isn’t that what muffty days are for? That’s the day when we declare our individuality that when you look closer is far from individual when your sat with a bunch of friends wearing the same branded clothes and the same desired make up.